Is Lard a Vitamin D Super Food? As more research rolls out on the importance of vitamin D to optimal health, foodies are looking to food sources to meet their needs. Lard (yes, pig fat) is one food that many point to as packed with vitamin D.
Is lard your vitamin D ticket? No. 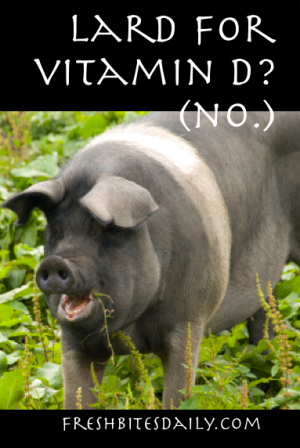 Lard has very small levels of vitamin D even if the pig is eating grass. I discuss the issue in the video below (or jump over to YouTube for a gander here). Your very best source of vitamin D is still sunlight. In my own routines, I typically cover up while I am gardening or doing yard work and I do lay out during the summer as I can. When I lay out, I expose my legs and torso but keep my face, hands, and upper chest and neck covered since I have the most skin damage in those areas. It is a great, relaxing ritual I try to do daily for at least thirty minutes. You will make most vitamin D in the summer and in the middle of the day. Those hours we are told to avoid the sun because we can burn so badly are the hours we make most vitamin D.
Our torso is the best producer of vitamin D, arms and legs are decent producers, and our hands and face are worst. In my case, my hands, arms, upper chest, and face have the most sun damage and so I cover them when I do purposefully lay out for sun exposure. They do not produce much vitamin D anyway. Sunscreen and glass (windows) block UVB rays and, thus, block the production of vitamin D.
If you are extremely fair (as I am), you will produce vitamin D with less sun exposure. Deficient or not, adding high vitamin D foods surely won’t hurt. Generally, fish and seafood are your best sources followed by eggs, but no food source compares to the power of sunlight. When the sun hits our skin, we turn it into vitamin D.
Grass Fed Beef: An Omega 3 Fats Super Food?